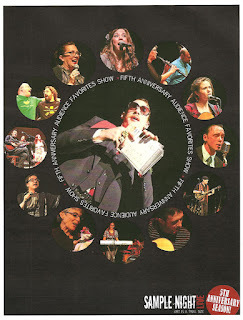 I can't believe it's been two years since I've been to Sample Night Live, the variety show held the first Wednesday of every month at the History Theatre that gives audiences a chance to sample local art (performance and visual). I attended the audience favorites show in December of 2010 and have always meant to go back, but something always comes up. So when my friend The Playbill Collector told me she was able to get some blogger tickets to this year's audience favorites show, I was happy to go along. And even happier to see that the host would once again be Loungeasaurus Rex (alter ego of the multi-talented Tom Reed). He never fails to entertain with his trademark mix of comedy, ad lib, crowd interaction, and cheesy (but good) lounge singing, all while clutching his notes in his multi-ringed hands. When an audience member told Loungeasaurus that he used to build semi-conductors, he made up a silly and clever song on the spot about semi-conductors. But not the usual definition, rather it became a song about a conductor who was not yet a full conductor. Hilarious. A couple of talented guitar players - Greg Herriges, impressive on multiple stringed instruments (who was also among the favorites in 2010), and Cory Wong, who played a couple of beautiful originals (you know he's a good guitar player because he spent not a little time tuning his guitar between songs, or as he said, playing the traditional Chinese song tu ning). A totally unique duo of oboe and upright bass, the Vecchione/Erdahl Duo, who were, as they said, "not as bad as I expected." In fact, they're quite delightful despite, or perhaps because of, the unexpected combination. They played in support of Minnesota Orchestra musicians. A little humor brought to us by puppeteer Margo McCreary and Jack the dog (who was interested in the same gross things that most dogs are interested in), and the very funny stand-up comedian Amber Preston, whose comedy is local and relatable and clever, told in an entertaining conversational style. A musician in a category all his own - the one-man band Crankshaft. Alex Larson plays guitar, drums (with his feet), harmonica and kazoo, and sings (covers and originals), and sounds pretty awesome, in a rootsy, bluesy, rockabilly sort of way. He was my pick for favorite of the night; I really appreciate his creativity and ingenuity in creating a complete sound all his own. The more traditional multi-person band was represented by Electric Children, a very cool bluesy five-person band (with dancers), and the crazy Irish pub band The Dregs (also returning from the 2010 show), who took advantage of the unrated second act by turning the very lovely Christmas song "Do You Hear What I Hear" into the less lovely but much funnier "Do You Have What I Have," a song about STDs. The strange and funny four-person comedy improv group Meat and Cheese, who did a hilarious skit in which two members spoke in unison, all improv. Crazy fun. The spoken word of Maximum Verbosity, who told a twisted Christmas story (and really, aren't they all a little twisted, what with the elves and all?). Two folky singer/songwriter/guitar players who would be right at home at Storyhill Fest, the modern-day hippie Heatherlyn (another returnee from the 2010 audience favorites show), and the night's winner, Sarah Morris, whose lovely voice would have easily filled the theater without the aid of amplification. And of course, I must also mention the Sample Night Live house band, The Smarts, keeping the crowd entertained with jazzy holiday favorites before the show, during intermission, and at the end while the votes were being counted (and the winner is - the Von Trapp Family Singers... sorry, wrong variety show). I very much enjoyed my second time at Sample Night Live, and I vow not to let another two years go by before going back. Yes, some acts were better than others, but that's the beautiful thing about Sample Night - if there's an artist you don't like, take heart, it'll be over in seven minutes, and then there will be another artist onstage, and you just might discover a new favorite. In addition to the diverse talent onstage, visual artists also present their work for sale in the lobby. And did I mention the prizes? While I didn't win, someone in my group did, as more than a dozen prizes were given out in the door raffle. A night like this makes me appreciate artists and the amazing creativity that they display. What makes someone think - "let's pair an oboe with an upright bass," or, "I know, I'll play the guitar, two drums, cymbals, tambourine, and a harmonica all at the same time, and sound really awesome doing it," or, "I'm going give voice to a lumpy dog puppet that's as interested in smelling people's butts as real dogs are," or, "let's attempt so speak in unison even though I have no idea what you're going to say," or, "I can slick back my hair, put on a cheesy 70s suit, make up a song on the spot, and make people laugh." Artists boggle my mind, and make me happy to live in the same world they do.